Cover boy Mookie Betts is small in size, but huge in talent. Well, it’s January once again, and that invariable involves: (a) clothes that make you feel like the Michelin Man; (b) another year of NFL playoffs (this time it actually involved my Chargers, woo hoo! 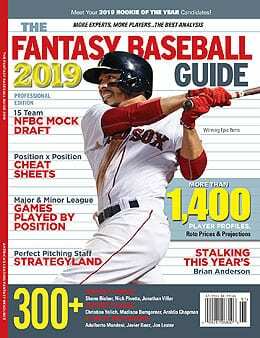 ); and, last but definitely not least (c) a brand new edition of The Fantasy Baseball Guide, the preeminent bible for Fantasy baseball preparation. This year marks a pair of milestones for RotoMan‘s quintessential Fantasy publication: the magazine has turned 20, and RotoRob has now been involved with the project for 15 years! Last year, real world work limited us to writing fewer profiles than we would have liked; this year, we made up for that with 434 profiles. Woo hoo! So… about that offer… Once again, we’re giving RotoRob.com readers a chance to save $1 when they order the online version (US$7.99; you need a web connection to view it, but it auto formats to any device or screen) or PDF version (US$9.95; this is a download that can be read on your device, best viewed on a desktop, laptop or tablet) of the magazine. You can also order the print edition of the magazine and have it mailed to you for $10.49. Simply click here, order which version of the mag you want, use promo code Rob19 at checkout and viola! You are now the proud owner of the finest Fantasy baseball publication in the industry. Whatever will you do with that dollar you saved? Perhaps start a college fund for your offspring? As per usual, this comprehensive pub features plenty of Team RotoRob-related contributions. Besides RotoRob, current and former RotoRob.com writers that aided in the creation of this masterpiece include: Buck Davidson, Tim McLeod and Herija Green. As mentioned, 2019 marks the 20th anniversary of the magazine and to celebrate, there’s a great mock draft following NFBC rules. There’s also a rookie preview section which features the Top 30 Rookies. An expert NFBC-style mock draft including analysis. The publication is expected to hit stands on January 16 (and there are reports that some people have already spotted it), but of course if you prefer to procure it online, once again, order here and remember to use the Rob19 promo code for a deal! As always, we’ve got the scoop on the current edition (shockingly known as 2017), and as per usual, we’re going to make our readers an offer they can’t refuse.